Anna Clari’s Farm Produce business, reaps the benefit of 21 hectares of Olive, nut and chestnut trees, this allows us to produce a high quality Extra Virgin Olive Oil that has obtained several local certifications for it’s quality, (Agricoltura Biologica and D.O.P Umbria Colli Assisi Spoleto). Especially the Denominazione di Origine Protetta Umbria dei Colli Assisi Spoleto, which is recognised at a European level. These certificates mean that we are proud to produce and sell a genuine and extremely high quality product. 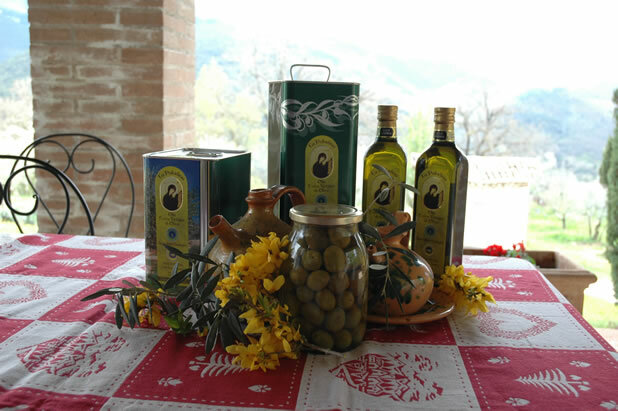 You can buy our Olive oil during your stay and we are happy to take you through the production process and how explain what makes our Olive Oil so unique.